As promised, I’m back with more from this year’s National Stationery Show, with beautiful images from photographer Brian Tropiano. I’ve been running around the show trying to catch up with old favorites and check out the work of new exhibitors, so the last couple days have just flown by! First up, a first time exhibitor that is a familiar face around here – Dingbat Press! Adrienne from Dingbat Press did an amazing job with her booth; each wall is covered with silver leaf! I’m loving Adrienne’s letterpress initial note cards and funny chess greeting cards. Smock is no stranger to the Stationery Show, but their sister company Bella Figura was also exhibited for the first time at this year’s show. There was a lot of color going on in the joint booth, from greeting cards to gift wrap to gift boxes to calendars to wedding invitations. So fun! The Ladies of Letterpress booth is a bit of a doozy – with TEN designer/printers exhibiting in a shared booth. It’s a lot to take in all at once, but there’s so much amazing work from a group of seriously talented stationers. 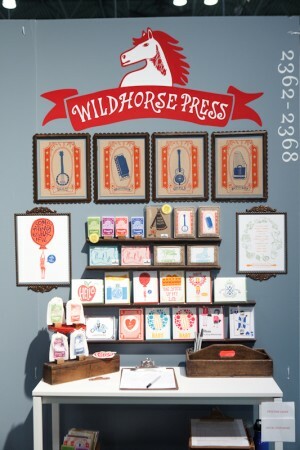 This year participating printers included Thomas Printers, Anemone Letterpress, Cleanwash Letterpress, Heartfish Press, Ink Petals, Wildhorse Press, Dandy Lion Press, Studio SloMo, Lulabelle, and Paper Lovely. *Smock, Bella Figura, Thomas Printers, and Dingbat Press are sponsors of Oh So Beautiful Paper; for more on my edi­to­r­ial poli­cies please click here. These are gorgeous! What amazing displays! I Love Dingbat Press, They did my logo and business cards! ohhhh wow. it’s been so amazing to see your coverage… The show was sprawling this year and I didn’t get a chance to get beyond my “neighborhood” to see what everyone had been working on. Your coverage has been amazing, and the photography of each booth and the products looks incredible! Thanks so much for stopping by our booth, Nole. It was SO lovely to finally meet you! i’ve got to tell her you’ve captured her here !! Does it bother anyone else that ‘nuptials’ is spelt wrong on that Studio SloMo wedding invitation? !